NALP announces the publication of Jobs & J.D. 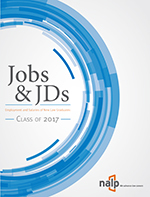 's: Employment and Salaries of New Law Graduates — Class of 2000, the only comprehensive study available on the employment experiences of recent law graduates. This 27th consecutive report documents the seventh successive increase in the employment rate of new law graduates. An increase in full-time legal employment accounts for most of the increase. At the same time, although full-time employment in other types of jobs decreased slightly, these jobs continue to account for about one in ten jobs, as they have since 1994. The median starting salary for all full-time jobs rose from $50,000 for the Class of 1999 to $51,900 for the Class of 2000. Escalating salaries at large firms widened the salary differential between private and public sector jobs. The median private practice salary increased by $10,000, to $80,000, while medians for jobs in government, public interest organizations, and as judicial clerks increased by just about $2,000. Of those graduates whose employment status was known, 91.5% were employed as of February 15, 2001, representing an increase of 1.2 percentage points over the Class of 1999 — an increase considerably larger than those for the prior two years, but still not matching those of the mid-nineties. Of those whose employment status was known, 79.8% accepted legal positions and 10.6% accepted positions not directly involved in the practice of law. Employment in full-time legal positions rose to 77.3% (compared with 75.5% for the Class of 1999), the sixth increase since 1988. 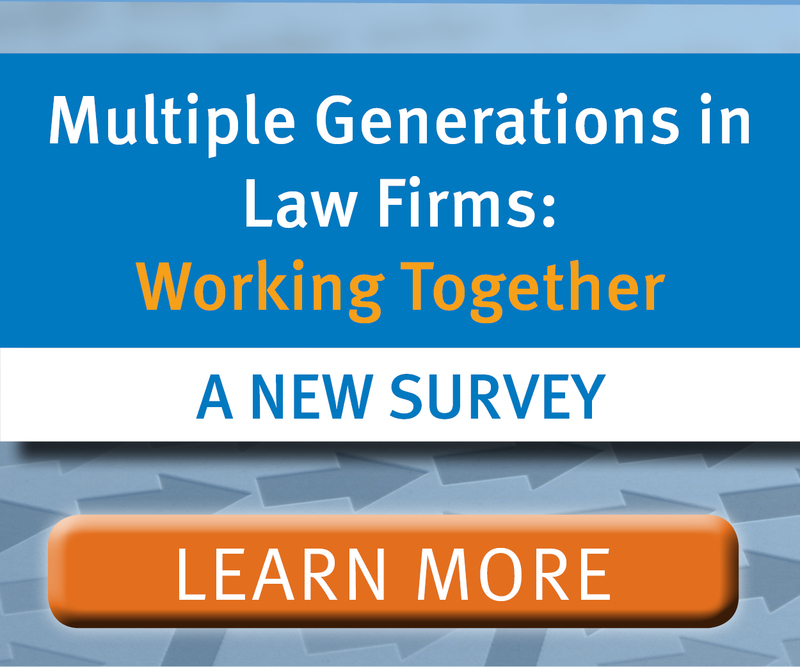 As in all prior years that NALP has collected data, the most common employment setting was that of private practice within a law firm. 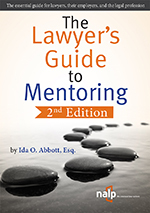 Of graduates known to be employed, 54.9% obtained their first job in a law firm. The percentage of graduates employed in private practice has fluctuated only between 55% and 56% since 1994 and is well below the high of 64.3% for the Class of 1988. Public service employment, including government jobs, judicial clerkships, and public interest positions, accounted for 27.5% of jobs taken by employed graduates, a slight increase from the figure for the Class of 1999. Compared to the overall median salary of $51,900, private sector medians are higher — $80,000 in private practice and $60,000 in business/industry; public service medians are lower — $40,000 for judicial clerkships and government jobs, and $34,000 for public interest jobs. The higher median in private practice notwithstanding, salaries between $35,000 and $55,000 were more common than salaries of $75,000 or more. In addition to documenting employment experiences for the class as a whole, the report clearly demonstrates differences with regard to demographics and geography. About 43% of employed African-American graduates took jobs in private practice, while about 57%and 55%, respectively, of employed white and Asian/Pacific Islander graduates did so. Employment patterns also differ between men and women, with women more frequently taking government, judicial clerkship, and public interest positions. Almost one-third of employed women took these types of positions, compared with one-quarter of employed men. Older graduates were less likely to go into private practice and more likely to enter academic or business settings. About 44% of employed graduates age 41-45 entered private practice, compared with 58% of employed graduates age 20-25. Over one-quarter of employed graduates age 41 or older took jobs in business/industry, a rate more than twice that of employed graduates age 20-30. In some cities, such as Dallas, New York City, and Pittsburgh, jobs in private practice account for most of the jobs taken by new graduates. In contrast, cities such as Minneapolis/St. Paul, Miami, and Austin offer relatively more government and clerkship opportunities. How and when graduates obtained their jobs and the extent to which employed graduates continue to seek a different job are also documented by Jobs & J.D. 's, offering valuable information for everyone interested in understanding the legal employment market. The two most common means of obtaining a job were a letter or other "self-initiated contact" with the employer (reported for about 23% of jobs), and fall on-campus interviewing (OCI), which accounted for 24% of jobs taken. Overall just over one-third of law firm jobs were obtained through Fall OCI; few jobs at small firms are obtained in this way. About 69% of the 28,506 jobs for which timing of offer was reported were obtained before graduation. One in five jobs was obtained after graduation but before bar results; the remaining 13% were obtained after bar results were issued. Jobs in the military, state or federal judicial clerks, and at large law firms were most likely to be obtained before graduation. The percentage of employed graduates who were still seeking another job decreased from 13.5% for the Class of 1999 to 11.3% for the Class of 2000. Graduates of color were the most likely to be seeking other employment, along with graduates aged 41 and older. The complete Jobs & J.D. 's report provides more detail on these topics as well as others, including salary levels and the nature of jobs by law firm size, level of government, and type of business; salaries for all states; full-time law firm salaries for over 200 cities; geographic mobility of graduates; job status by demographic characteristics; and employment patterns for all states and selected cities.